When the sun is setting over Bedford Stuyvesent, and the songs from the muezzin in the nearby mosque fill the air calling the faithful to prayer, there is no better time to file into local favorite Ali's. And as the name suggests, you would be a fool to ignore their glorious, heaping mounds called roti. Ali's is definitely not the place to expect kind and courteous staff. Ali himself (guess?) struggles to run back and forth between order and pickup windows, jotting down orders and trying to make sure the cooks have all the right info. It seems like every order needs to be said at least twice no matter who says it though, a real comical gap in communication exists here for some odd reason. Hope though that he takes your order, as if he's around the corner and you have to scream through the window to the ladies in the back, your order is effectively being broadcast for everyone to hear, and don't even think about asking questions! It's all fun and quaint somehow though, and makes procuring your delicious snacks that much more rewarding. The major two panels of the menu are split between "rotis" and "dinners," but one of these gigantic rotis, which all range between $4-6 is more than enough to be called dinner. The curry chicken roti ($5.50, below both before and after opening) is filled more with potato than anything else, but does have a couple big chunks. Interestingly enough, the pieces are still on the bone and have to be pulled out and eaten separately with your hands like fried chicken. 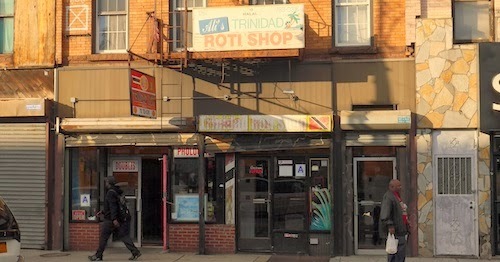 The curry is up to par with the best Trinidad cuisine in this city has to offer, and it is obvious the chicken has been slow cooking in that stew all day as the meat falls off the bone. The cheapest option on this side is the potato and chana roti ($4, not pictured), which is basically the same thing without the chicken pieces. The beef, oxtail, and other options are all strong and worth the good variety in life if you return for multiple visits. 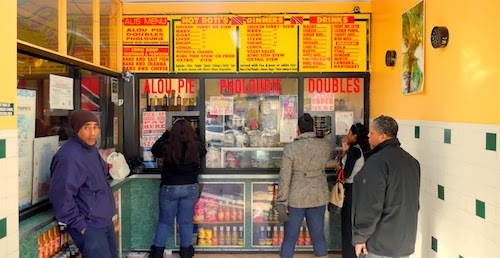 Meanwhile, the alou pies and doubles are better around the corner at A & A. Unfortunately you will have to wait until tomorrow, as you're stuffed beyond belief by Ali. 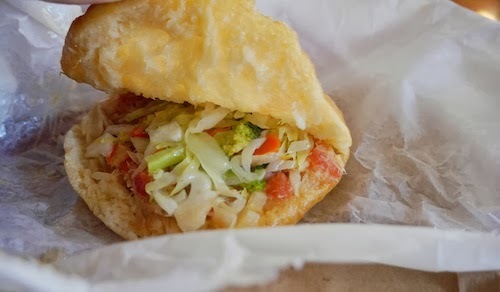 The bake and salt fish ($4, above) is both salty and fishy, but satisfying despite its greasiness. It grows on you bite by bite, even if the first is not what you thought. The doubles here lack pizazz without tamarind sauce, which they charge you an extra 25 cents for.